Tenerife's potato history goes back to Juan Bautista de Castro. This man owned the farm Finca Casa la Pared at Icod el Alto and brought the potato from Peru. He found it in the region of Ayacucho. The latter was conquered, i.e.fortified by the Spanish from from 1532-1537. 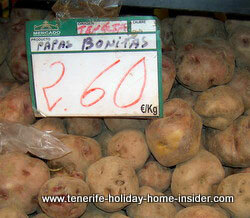 What is a Tenerife potato? It is called Papa in Canary Island Spanish, contrary to Castillano Spanish from mainland Spain. You must have heard of Papas arrugadas. 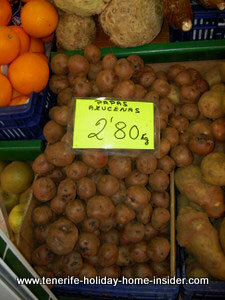 They have become a legend of Tenerife potato history with tourists. Depicted are Papas Arrugadas negras next to oranges, apples and celery. The tiny potatoes seem to have little grumpy faces which were carved with arrugas (wrinkles). By the way, the potato or Tenerife Papa is a vegetable tuber which belongs to the family of night shadow growers. Potato history of growing habits in Tenerife. The Papa puts up with poor, sandy soil and can grow in altitudes, as happened in the Peruvian Andes. However, it doesn't like whet feet or constant rain. Also, this tuber stores best in a cool, dark and dry place, such as in a potato bed, where air can enter from all sides. The Tenerife potato thrives by el Guindaste Rambla del Mar, almost by the sea. It also does well at over 1000m. However, it wouldn't be practical to cultivate it above Tenerife's mist belt which stops at about 1200-1500 meters. Icod el Alto, la Guancha, some parts of San Juan de la Rambla, Palo Alto of Los Realejos and specific areas of la Orotava are good for such tubers. Some spots at Isla Baja tolerate them too. Icod el Alto and la Guancha: Best for the Bonita llagada at about 500 m above the sea. Emiliana blanca, Veranera blanca and Marrueca. Icod el Alto : Most planted the Bonita de ojo rosado as seen in the photo beside. Then, other varieties are found in Tenerife soils, such as the big, white King Edwards potato. The latter is often cheapest in Tenerife supermarkets. Papas bonitas types i.e. brown, yellow and red, except the mini black one. You would think that purple potatoes may carry too much copper, however that doesn't seem to be the case. Best time for planting Tenerife papas? This may be done twice yearly. However, Bonita seed tubers are always placed underground by January. Their harvest time is July. 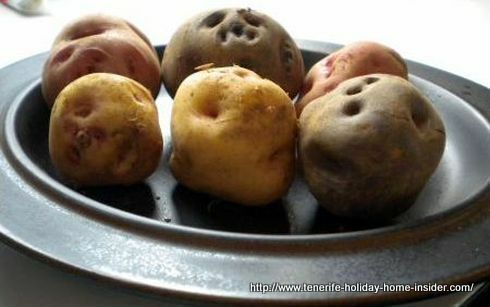 The potato must be boiled or steamed until very soft or it must be baked or fried which can be in foil or oil. When did Tinerfeños start eating potatoes? We know from Juan de Castro's descendant Dr.Juan Bautista Bandini that the potato had become a stable diet all over Tenerife by all classes by 1816. It was only eaten by everybody in Europe by 1780, as people were skeptic. They didn't trust a plant whose leaves were poisonous and whose raw bulbs were just as lethal. Eventually, they all bought the miracle root. That's how the French fries and Brussel's Fritten came about, much later. The potato disease is blight which is a soil potato fungus. It gets carried on by irrigation or by heavy rain. A Tenerife blight problem hasn't come to my attention. A country must never become dependent on one single crop, That could be rice, wheat, potatoes or whatever. Potato blight caused havoc in Ireland. It was fatal, as France found a cure much too late. Potato history of distribution in Tenerife? The farmstead Hacienda Casa la Pared of Icod el Alto is to be thanked for that. La Pared was a historical country inn. It accommodated men and beast, while they traveled on Tenerife's vital Camino Real or Kings's Highway all around the Island, until tourism started. The Casa la Pared with its 200000 m2 was a Tenerife halfway house. Its warm and welcome owners took everybody in. There, rich and poor were fed the previously unknown crop which is known today as papas or potatoes. That was beside Gofio whose flour was home ground like this on the farm. 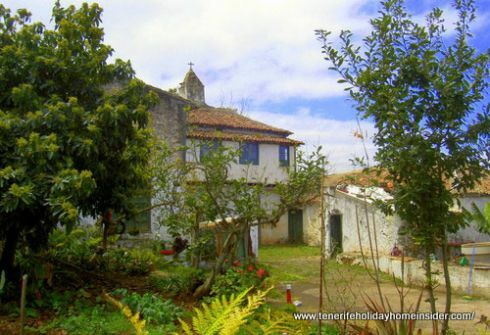 Monks, traders, farmers, you name them, all past by this renown country inn 500 m above sea level. There, they also rested their horses or donkeys. Needless to say is that the finca's fame has lived on for centuries. Sadly, hardly any farming is done there today. However, the nearby school Colegio la Pared borrowed its name. It passes on its good reputation in a similar social spirit. How spend the night in Icod el Alto, nowadays? Today, take a break at a different country inn. It is the Icod el Alto Hotel Rural Casa Blanca. There, you can even have a massage after a cycle tour or after taking on the terrible route 0-4-0 past Icod. Many important people will attend this so called free Forum about the Potato in order to promote the crop and its cuisine in regard to the Canary Islands worldwide. Famous chefs will present potato dishes that may be tasted. There will also be talks and discussions which include the plant's history. 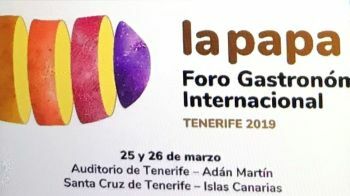 Location of event is the Auditorio in Santa Cruz the Tenerife capital and the dates are March 25 and 26 of 2019.
the municipality which is said to have been the cradle of the European potato.